The body length is about 2 inches, with a 5 to 6 inch span. Specimens raised in captivity may be larger. Adult females are larger than adult males. Males live eight to ten years. Captive females may live as long as 25 years. 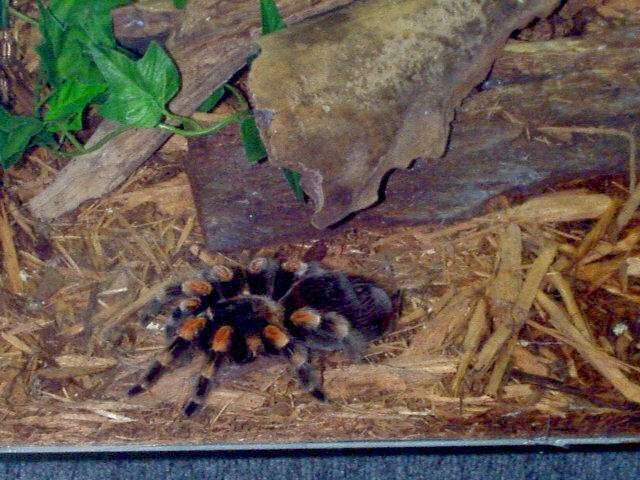 This tarantula was the most popular pet tarantula in the US until over-collecting endangered its habitat. Bananas used to be shipped to the United States in big bunches cut from the trees. Red Knee tarantulas were once imported accidentally into the United States with the bunches of bananas. Now bananas come in boxes instead of bunches. Red knee tarantulas live in the western parts of Mexico near Acapulco. They eat mostly insects that are similar to crickets and earthworms. Only the giant tarantula, the Goliath Birdeater, actually catches birds. Red Knee tarantulas are bred in captivity. It takes about 91 days for the eggs to hatch. Some tarantulas have been observed to present regurgitated liquid to spiderlings, but very little is known about how (or whether) spiderlings are fed in the wild. Very few of the hundreds of spiderlings from an egg sac actually reach maturity. Spiderlings grow very rapidly when food is available. At intervals as they grow, they must molt, that is, shed their outer covering. The outer covering is called an exoskeleton. As they grow up, the spiderlings move away from their mother's burrow, but usually not very far away. This means that a group of spiders, sometimes called a 'colony', will have individual burrows within a few yards of each other. Many tarantulas from both hemispheres stridulate, that is, they make sounds by rubbing special bristle-like structures on the chelicerae against bristles on the pedipalps. (Tarantulas use their chelicerae and pedipalps to grasp prey animals.) The Red Knee tarantula is not known to have bristles for stridulating, but has still been observed to make a variety of sounds. 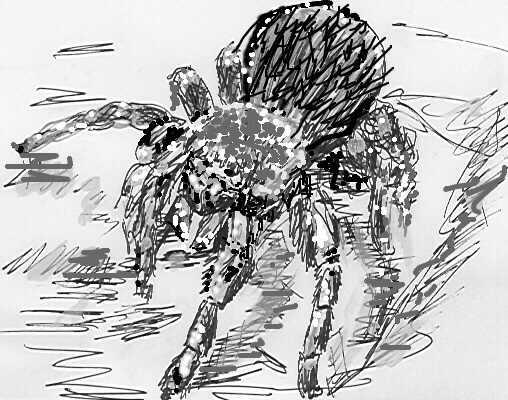 The role played by the sounds in the tarantula's wild environment is not known. When the sounds are observed in captivity, the spider has usually been disturbed. Brachypelma tarantulas are colorful pets and thought (by spider keepers!) to be docile. However, Brachypelma smithi tarantulas have tiny (0.03in) bristle-like structures that they can kick off their bodies and into the air around them. These tiny objects, called urticating hairs, can penetrate skin or mucous membranes and cause pain and itching. 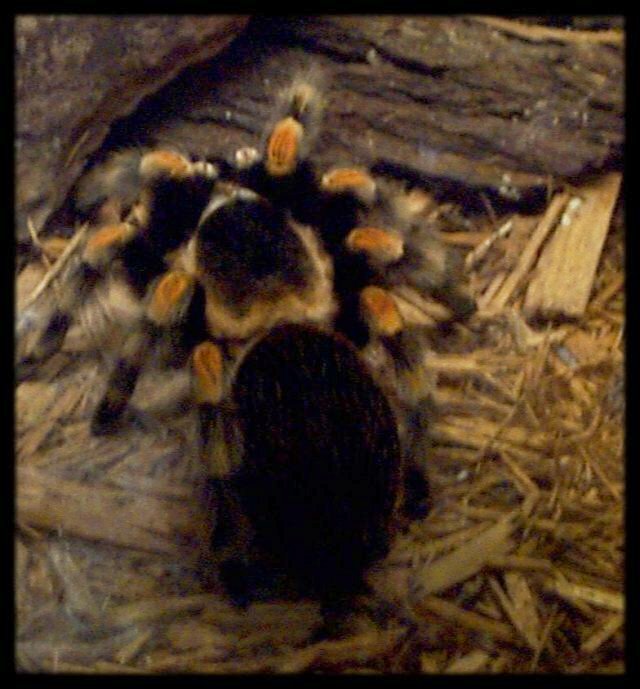 This behavior may help the tarantula defend itself in its wild environment. No one is known to have died from exposure to urticating hairs, but several people have gotten very sick, especially when the hairs got stuck in their eyes. Be safe, get help, not hurt! The drawings are from the author's collection. The tarantula on the right looks like she has ten legs, but the pair of little appendages that are right in front are pedipalps and used for grasping instead of walking. The keeper I talked to didn't know anything about the spiders except what they ate. The animal is currently off exhibit. 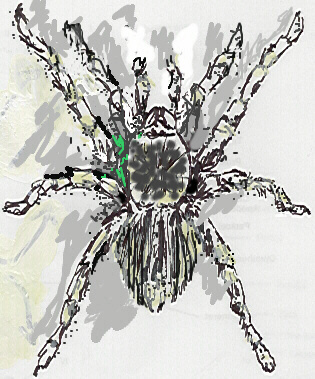 The spider I saw in the zoo has a bald patch on her abdomen which sometimes indicates that the animal is about to molt: Sometimes a bald patch means that the animal has been stressed. I guess I'd be stressed too if people banged on my cage all day. A Field Guide to Spiders and Scorpions of Texas, John A. Jackman, Lone Star Books (Gulf Publishing), Houston, 1997 and 1999. "Tarantulas: Earth Tigers and Bird Spiders," National Geographic(September 1996), Richard Conniff, National Geographic Society, p.98-115.